Roseann Sdoia leaves Spaulding Rehabilitation Hospital in Boston in May 2013 after losing part of her right leg in the explosions near the finish line of the Boston Marathon. 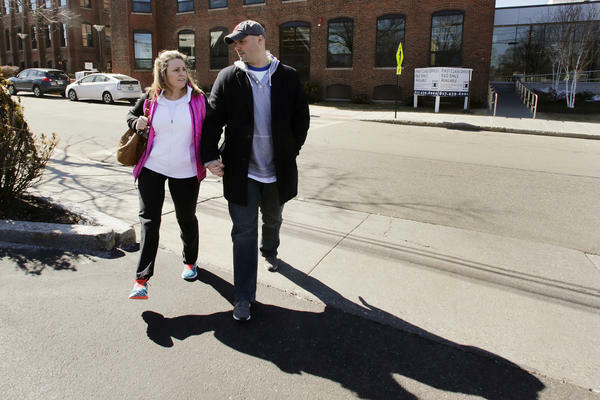 Sdoia walks with Boston firefighter Mike Materia in 2014 after a doctor's appointment in Newton, Mass. She and Materia are now married. 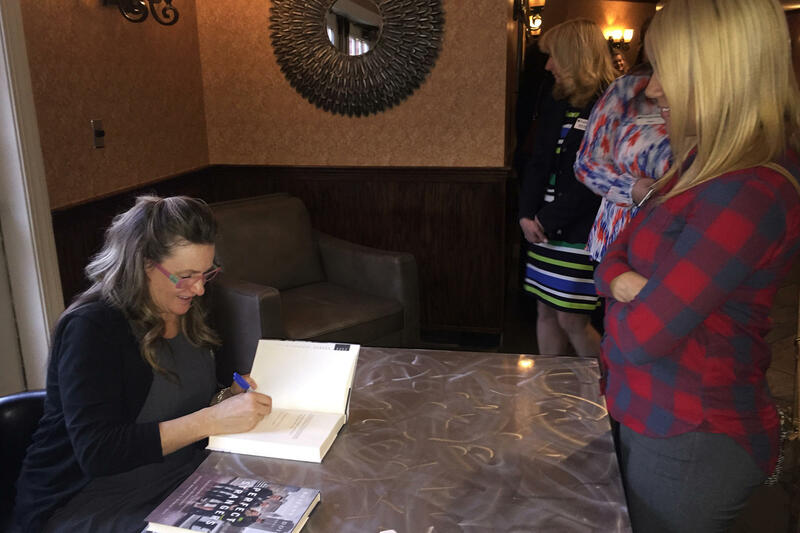 Sdoia signs a copy of her book Perfect Strangers. Roseann Sdoia, who lost part of her right leg in the Boston Marathon blast five years ago, says it's still sometimes hard to comprehend how her annual outing to watch the race on that sunny Spring day changed her life forever. "I still wake up in the morning five years later and go 'Oh my God, I don't have a leg,'" she says. "Even though I live it every day, and every day I have to put this stupid [prosthetic leg] on and lug it around ... I still have a really hard time thinking to myself what really happened." Survivors of the bombing, including Sdoia, gathered Sunday for a solemn wreath laying ceremony marking five years since two bombs planted near the finish line killed three and injured hundreds more. That disbelief is one of the reasons she's made it her business, literally, to spend her days talking about her story. Retelling it, she says, helps her get her head around what happened. She also hopes it encourages others who are facing their own challenges. "I want to be there showing people that you can come back to the other side again after having something tragic happen to you," she says. Walking into a recent speaking gig, Sdoia swings her prosthetic leg up the front steps, while lugging a box filled with dozens of copies of her recently published book. "This is the tricky part," she says, a little out of breath. Fiercely independent, she brushes off any offer of help. "I guess it makes me feel normal," she says. "It's something that I would've done before, so anything that can kind of make me feel like I'm not handicapped ..."
Inside, she takes the stage as the keynote speaker invited to address some 300 employees of a local bank. She begins by telling them about the many years she went to watch the marathon, first as a kid with her family, and then in recent years with her friends. "The energy that is in the city of Boston is truly electric," she gushes. "It really was my favorite day." She shows photos she took on "that gorgeous spring morning" watching the Red Sox at Fenway Park, before heading to the marathon to cheer on a friend who was about to cross the finish line. "Then there was a loud explosion down to the left," she recalls. "Everybody stopped and the crowd went silent." Sdoia turned to run, but two steps later, she "saw two flashes of light and then everything went blank." She had run right into the second bomb. Shortly after Sdoia came to and realized her leg was seriously injured, she admits to having "a quick thought of not wanting to live with such adversity." But she says she thought of her friends and family and decided "I was in a fight to save my life." Her first challenges were to keep herself calm, get someone to answer her calls for help, and make sure she didn't lose consciousness. Sdoia pauses and looks out at the bank tellers and branch managers listening. Her challenges of trying to stay alive on the sidewalk that day, or in later months learning to walk on a prosthetic leg may be unique, she tells the crowd, but the lessons of resilience and resolve are universal. "This is how I chose to stay positive," she says. "I wasn't going to get better any other way." Life is all about choices, she continues, just as it was for the two bombers who chose to maim and kill that day, and for the countless others, who chose to rush into harm's way to save lives, including hers. She recounts how she was kept alive by three Perfect Strangers – the title of her book. There was the college student, Shores Salter, who cinched his belt around her leg to stop her from bleeding to death. There was the police officer, Shana Cottone who helped keep her calm and managed to flag down a prisoner transport vehicle to take Sdoia to the hospital, when all the ambulances were zooming by already full. And, there was the firefighter Mike Materia, who lifted her into the truck, held her hand all the way to the hospital, and came back to check on her the next day. As he would for many more days, thereafter. "He's now my husband," she tells the crowd, which prompts a wave of "awwwwws" and applause. Mike Materia shakes his head at the thought of that public declaration. At home on the couch with their two dogs, Lou and Sal, Materia admits he cringes at the spotlight, as well as any mention of his heroism that day — or his romance. The guys in the firehouse can be merciless. "He gets embarrassed easily," Sdoia laughs. "Aw stop," he pleads as Sdoia keeps giggling. "I love when he smiles," she coos. Sdoia's family saw something special in Materia too, even from those first days in the hospital, when her mom kept nudging her about that "cute fireman" who kept coming by. "She was harassing me," Sdoia recalls. "So I'm like "Seriously you're trying to fix me up?! I was just blown up!'" Now, five years after the blast, and about five months into their marriage, they're still trying to get their heads around how things can so suddenly flip from good to bad, and from bad to good. Sdoia's quick to concede, she still has plenty of ups and downs, but, overall, she's surprised even herself with how she's been able to cope. "If somebody had told me that this is what I was going to happen to me, I would've said I don't want to live like that," she says. "But you don't know. You don't know until you're there. And I'm doing okay." Back at her speaking gig to the bank employees, dozens of people line up to buy Sdoia's book. One after another they thank her for sharing her story, and for being an inspiration. One says she's buying the book to help her husband who was catastrophically injured. Another is getting it for her sister, whose husband suffered two strokes. "This is why I do it," Sdoia says, "I was in those shoes." She hopes others will realize that "it might take a while," but things can turn out okay. "As long as one person comes up to me and says 'what you've said has helped me'... it makes me really happy." Sdoia says she wants to pay it forward, like those "perfect strangers" did for her. Especially the one she calls "her fireman." When Materia runs the Boston Marathon Monday to raise money for a charity set up in memory of a friend and fellow firefighter who was killed in the line of duty, Sdoia will be back at the finish line — this time supporting him.